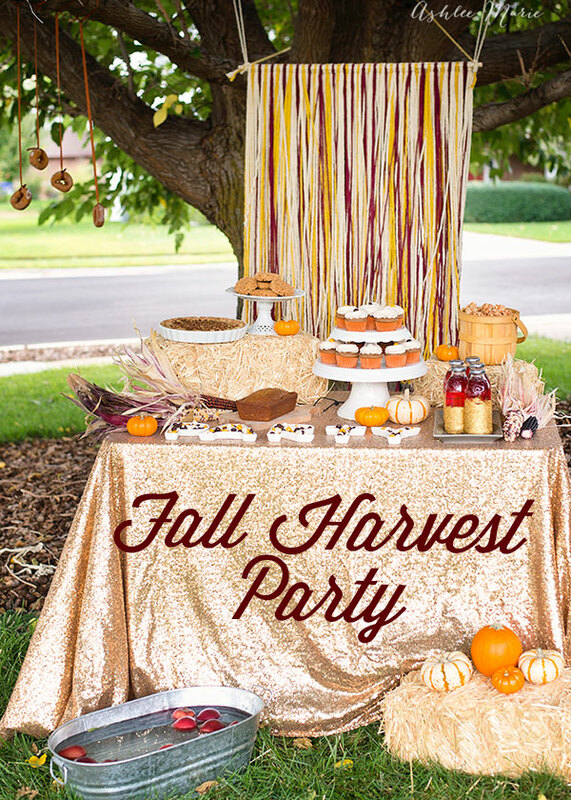 I actually put this party together in a day, so it’s super easy and everything can be hand made or bought pretty easily. Of course some things, like the fabulous sequin table cloth, I just HAPPEN to own, but a regular tablecloth will do just fine! I collected a bunch of small pumpkins from my local store and some colored dried corn and just used those to fill in along the table and it’s amazing how much something so small can really add to the over all feel. 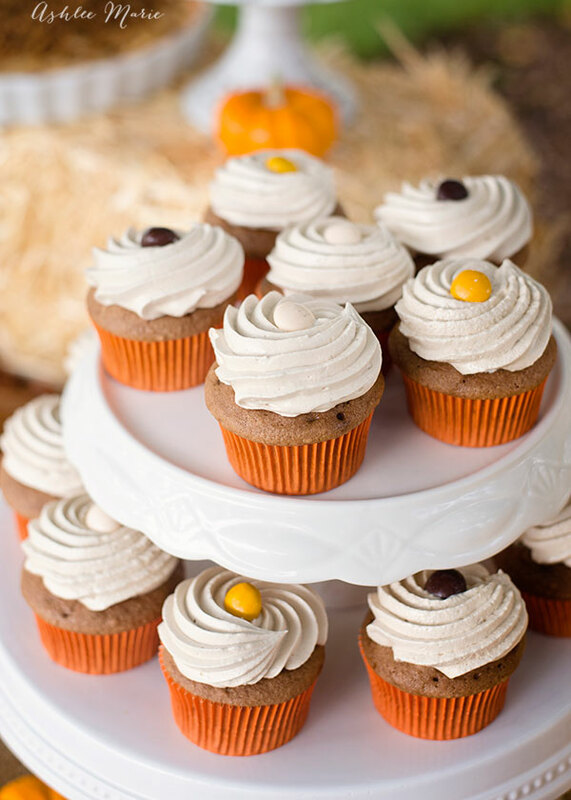 Take a medium sized frosting tip, a cupcake corer or a small spoon and scoop out the center of the cooled cupcake. Put eggs whites, sugar and corn syrup in a bowl over a saucepan of boiling water. Beat with a hand mixer until soft peaks form- about 4 mins. Take off heat and beat with electric mixer with whisk attachment on Med high till stiff peaks form- about 30 sec. But you can’t JUST have cupcakes! 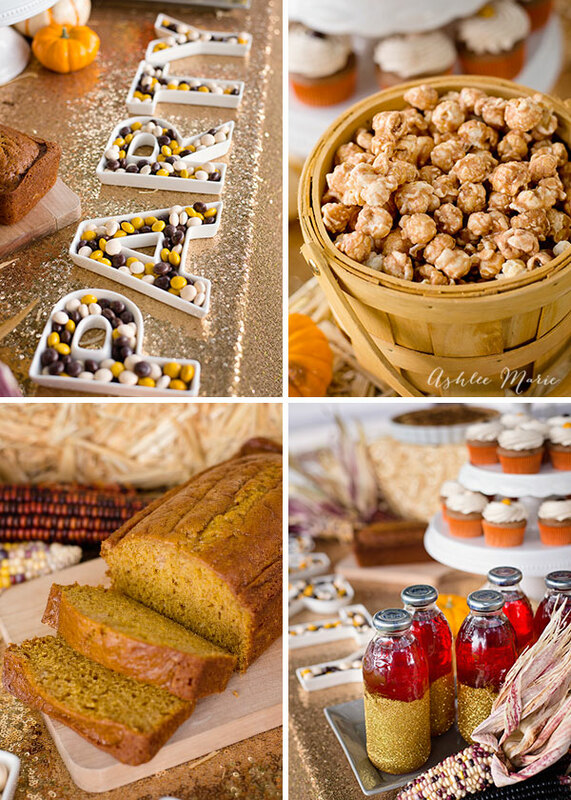 I came up with a ton of other fall favorites and of course activities! 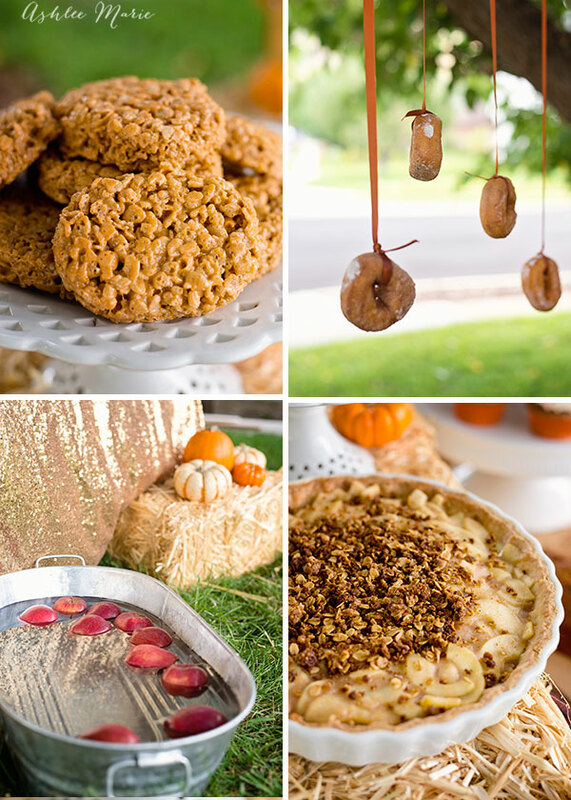 It wouldn’t be a Fall party without bobbing for apples or having a donut tree! Stagger the heights to accommodate all your guests. And my apple tart topped with a crumble and pumkin spice rice krispy treats. Always crowd pleasers. One of my biggest tips I’ll give anyone asking about create a party is to STAGGER the height of your table. When everything is the same height you miss items in the back, and it visually isn’t as dramatic. I added height with small hay bales and cake stands. 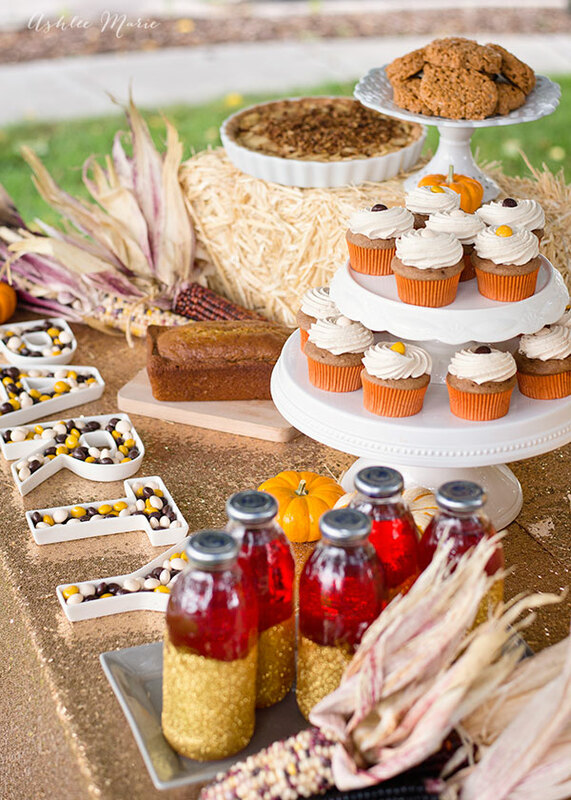 I already had the cake stands, shocking I know – but I found the hay bales at Walmart – along with the mini pumkins, but get them early in the season, if you wait too long they’ll all be gone… trust me. I picked up these lettered candy plates years ago and this is only my second time using them! I LOVE LOVE LOVE how easy it is, and how it fills the table so nicely. Add some Churro popcorn (or cinnamon toast popcorn) and some pumpkin bread and all you have left is the details! To make this super flowy and soft backdrop it’s super easy. 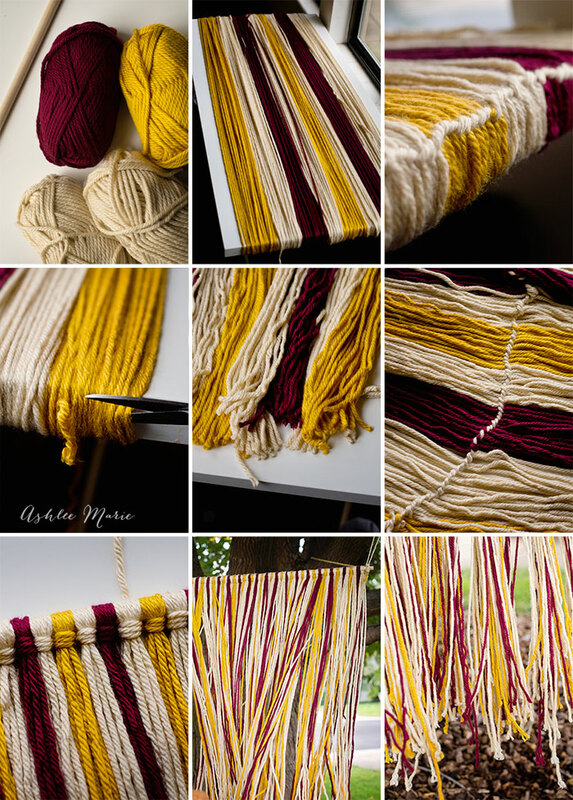 I had 8 skeins of super bulky yarn (2 burgundy, 2 gold and 4 ivory). I wrapped them around a long table I have (and use for food photography in my front windows). Then BEFORE cutting I took an extra strand of yarn and wrapped it around one side of the table, every 3 strands. This way when I cut the OTHER end I not only knew where the center was, but I was able to easily grab just 3 strands at a time from the center without making any knots. Tie the center around a 1/2 inch dowel changing colors as you go. Hang the dowel from the wall or a tree and voila, it’s so soft and warm and was perfect for Fall! And my final detail… something I love to do at parties, dress up the drink bottles! 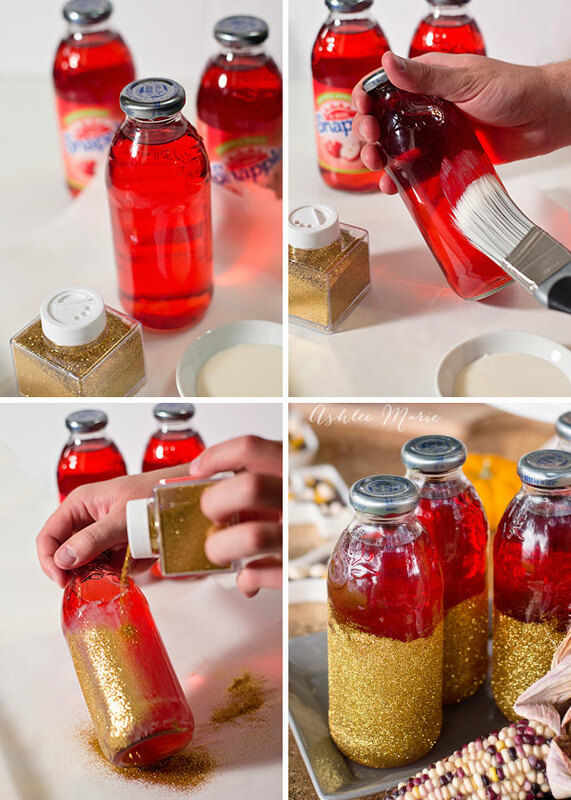 I’ve been known to spray paint water bottles but for these pretty glass Snapple® Apple Single jars I wanted to keep it in keeping with the table, so gold glitter. I took off the wrappers, painted craft glue along the the outside of the glass then sprinkled fine gold glitter all over! 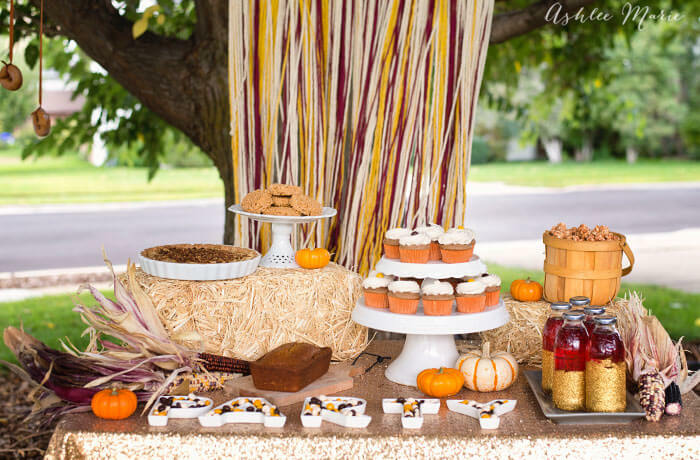 You CAN use painters tape to get a nice sharp line, but I wanted these to be rough with staggered heights, more in keeping with the relaxed easy going feel of this Fall Harvest Party! So, like I said, I put together this entire party in a day! I got everything I didn’t already own, or wasn’t making in one shopping trip and can I just say my family was thrilled to have an out of the blue celebration (it’s the week of my birthday so I consider this a “welcome Fall” AND a “happy birthday to me” party). I loved celebrating so many of my favorite things! NOW off to wear boots, sweaters and get me some comfort foods! 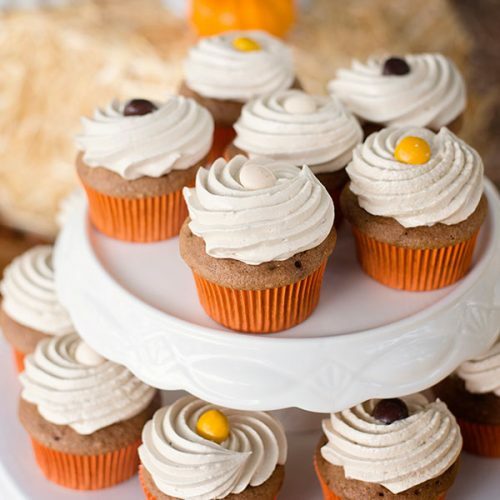 SOOOO what is YOUR favorite thing to bake in the fall??? Hit me up! Is there something I should be making or eating that you just love? Totally shocked when I saw cupcakes instead of a cake but fell in love when I saw the filling. Great idea to use apple sauce in place of the oil. Can’t wait to test that out. 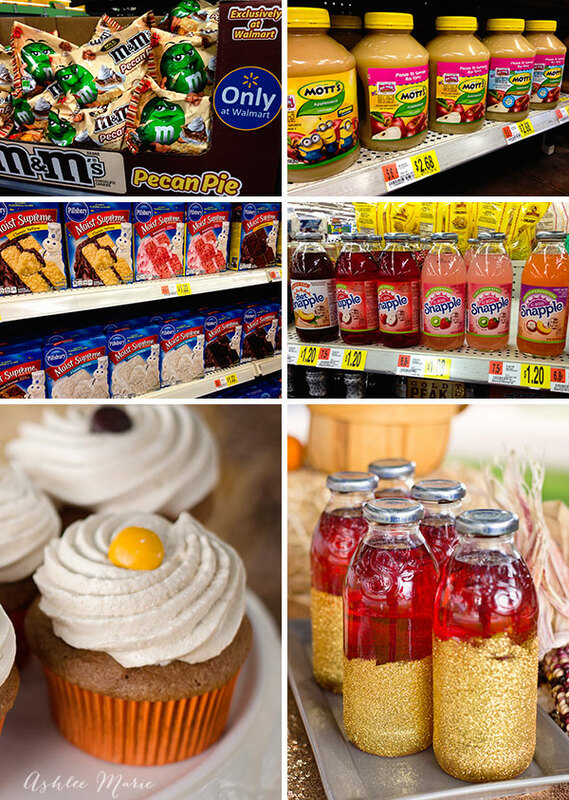 Pecan Pie M&M’s sound delish! I have like 5 sets spelling out different words, so excited to finally use one! Thank you so much! My kids did too!